Having a family can be messy and difficult. Sometimes family life is so hard, I can barely handle the strain. But through it all, the ups and downs, I'm thankful for my family. With Thanksgiving just a few days away, I want to reflect on the ways I'm most grateful for my family. This is a list of some of the reasons why I'm thankful for my family, in no particular order. 1. I'm thankful for the toys I step on, the piles of laundry waiting to be folded, and the stashes of built up paper. I'm glad I have mess. All these things drive me crazy, and I can never seem to keep ahead of the junk. I'm thankful it's around, though. It means my home is lived in. It's a safe space where my family can let their guard down. 2. I'm thankful for income. At this point in my life, I am a stay-at-home mom. My family's main source of income is my husband, Ryan. There are times I feel bad for not making money, and I may complain about not having enough. I'm grateful my husband is willing and able to provide for our family financially. 3. I'm thankful for my family's love. Through good times and bad, I'm grateful for the love they give me. 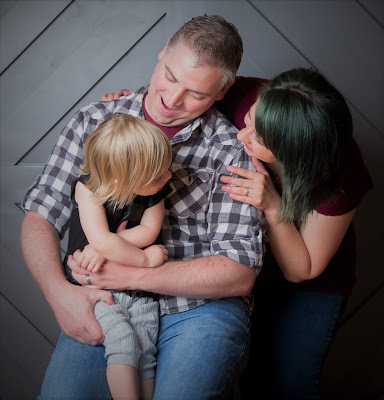 I love my little family so much, and I know they love me, as well. Having that kind of love is an amazing gift, and one I will always cherish. 4. I'm thankful for little kid cuddles. My daughter, Nini, is a toddler and starting to grow out of the super cuddly phase. But I'm grateful for her cuddles when I can get them, and that she still likes being rocked before nap and bedtime. Even when she no longer wants to cuddle with me, I will be thankful I had the opportunity to bond with her in that way. 5. I'm thankful for inside jokes and random bursts of laughter. Ryan and I have many inside jokes we think are hilarious, likely no one else would understand or find funny. I'm glad we get to connect through out mutually stupid sense of humor. I'm equally thankful for a toddler who does random and ridiculous things. Ryan and I will start laughing, and Nini will join in and often repeat her silly behaviors to get more of a response from us. 6. I'm thankful for a wonderful spouse. I know I'm so lucky to have Ryan in my life. It's a rare gift to meet someone who gets you so well. We've been married for almost five years, and I still appreciate how wonderful he is. I'm grateful for a strong marriage where we can communicate and continue to grow together. 7. I'm thankful for having my family to get me through difficulties. Life can be devastating at times. I'm grateful I have my family to help me when times get tough. I can rely on them, and in turn, they can lean on me through life's challenges. 8. I'm thankful for being able to do fun activities together. I'm grateful my family can be together on holidays, go to the park, or simply stay home and watch a movie together. I'm glad my family are my "go-to" people to do fun things with. 9. I'm thankful for a strong support system in my family. We can walk together through life knowing each member will be there for one another. So that wraps up my list. I know I could keep going about the ways I'm grateful for my family, but then I'd have a novel on my hands. Now I'd like to hear from you. 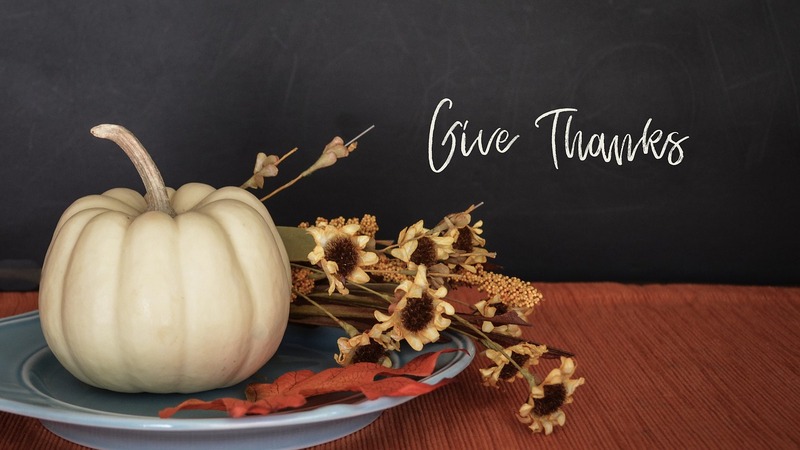 In what ways are you thankful for your family? Let me know in the comments! "My Experience with Moms in Drug Treatment"
"Family Connections and Crossing the Generational Lines"
With the holidays coming quickly, many of us will be spending a great deal of time with family. This time of year has made me reflect on my own experience with extended family, particularly great-grandmothers. My daughter, Nini, has the opportunity to live within fifteen miles of her three living great-grandmas. Due to this close proximity, Nini has a good relationship with all three of these great-grandmothers. Generally, we get to see each of them about once a month. 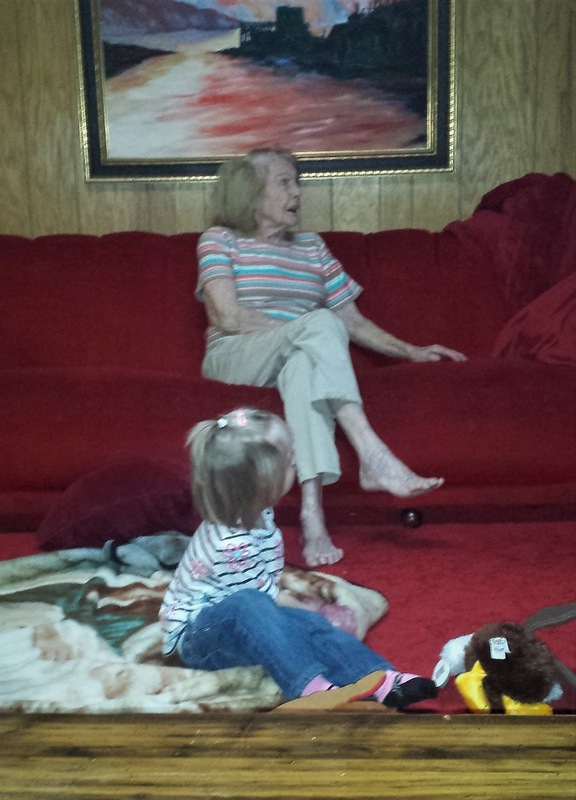 I enjoy watching my daughter's interactions with her great-grandmothers. Despite the years of age difference and the four-generation gap, these great-grandmas adore Nini. She in turn, loves to spend time with them. Recently, she has spent even more time with her great-grandmas. Nini has been able to visit with each of these women in their homes within the last week. When I tell my two-year-old daughter we are going to visit one of her great-grandmas, she will exclaim, "Granny!" or "Grandma!" She starts bouncing with excitement. Nini has a special connection to her great-grandmothers and she's very social with them. She loves to get out the toys they keep for the grand kids. 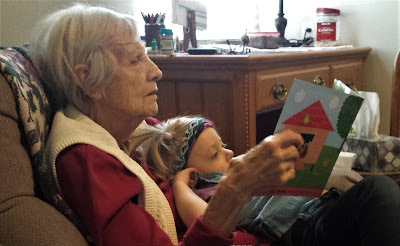 Nini will take toys and books to her great-grandmas for them to read to her and play with her. These great-grandmas dote on her. I think Nini's ability to spend so much time with her great-grandmothers is a blessing. She gets to cross the age and generational divide and connect with these wonderful ladies. Nini's three great-grandmothers also get the opportunity to get to know their posterity in a real and authentic way. I benefit, as well. 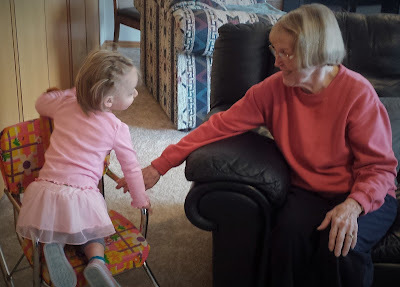 I get to watch my daughter and her great-grandmothers enjoy one another, which is very special to see. Also, I have the chance to visit and get to know these women. Some day, these great-grandmothers will no longer be with us on this earth, and there's a chance Nini will not remember them. My responsibility as her mother will be to share the stories and pictures with Nini of her connection to her great-grandmas. That way, her great-grandmothers will continue to live on in her heart. I think it's important for all of us to make familial connections across the generational lines. It's especially significant for our kids to be familiar with extended family and older generations. If you and your children have the opportunity to visit with grandparents and great-grandparents, I encourage you to do so. Call, visit, keep in touch. If these people have passed on, share stories and insights with your kids. Our children, as well as ourselves, can learn a lot from older generations. You could even go back farther and research your genealogy and ancestors. I believe these family ties are important. Knowing and connecting with older generations helps us know ourselves better. It also helps us to see into our future through our children. 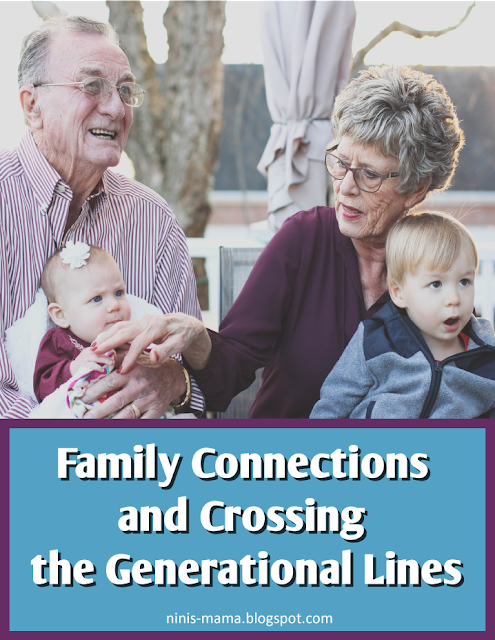 How do you and your children connect with grandparents and great-grandparents? Let me know in the comments. This week Nini and I went to story and activity time at our local library. One of the activities was dress up play, which was lots of fun. Nini especially enjoyed the pirate costume. She kept putting on the hat and excitedly proclaiming, "skeleton!" Nini had so much fun that when we got home, I decided she needed a pirate hat of her own. 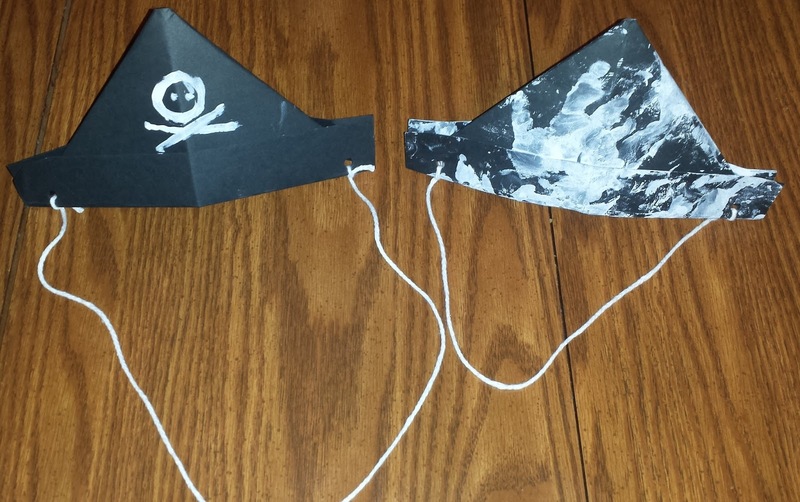 We went ahead and made our own pirate hats! 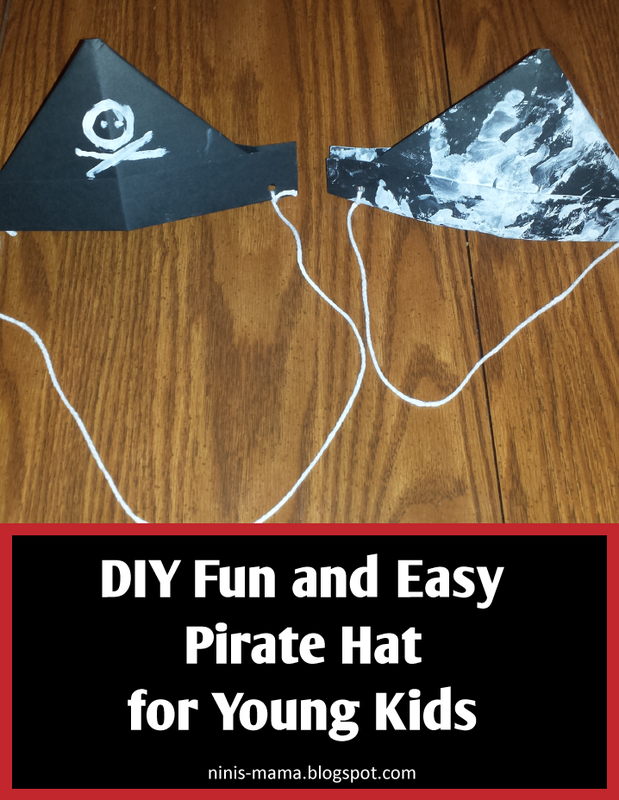 To make the pirate hats, I found a tutorial on WikiHow. It was pretty basic and easy to follow. I'm sure there are other ways to make a pirate hat, but this one worked well for me. The original instructions call for newspaper, but I decided to use some black construction paper I had around the house. It's seems more piratey anyway! 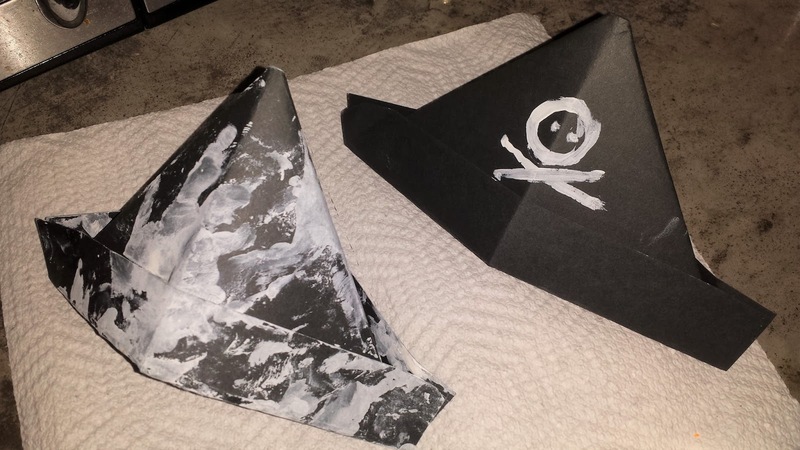 After folding the papers into pirate hats, I got out some Crayola white paint. 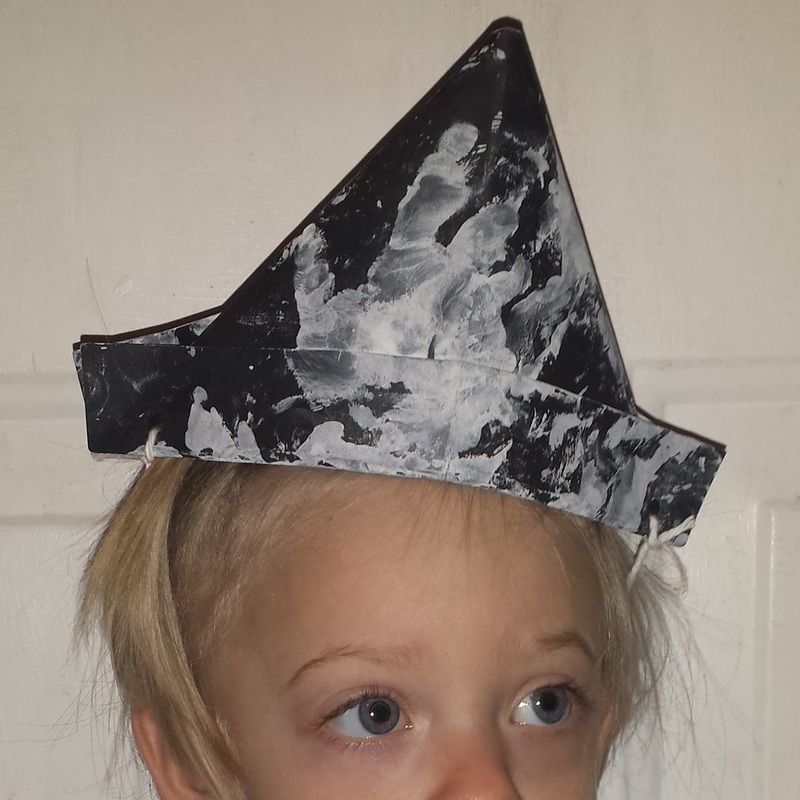 I gave Nini the pirate hat and paint, and let her get creative. 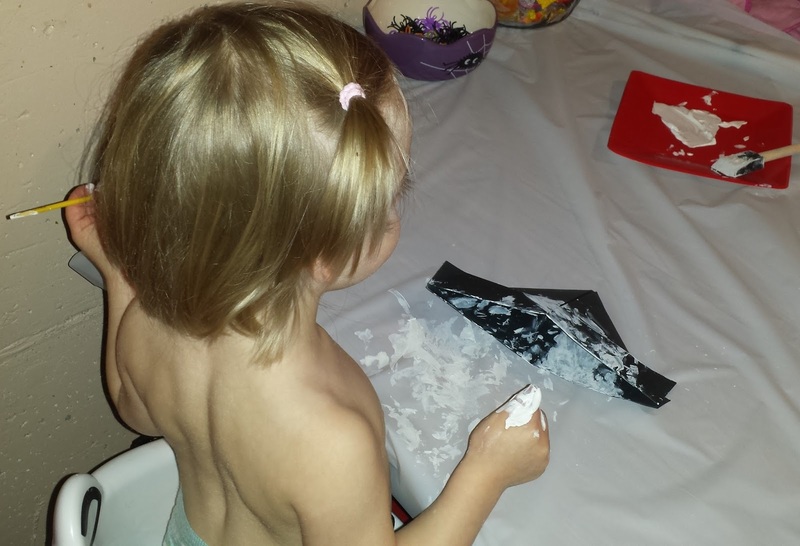 She especially enjoyed finger painting. I got in on the fun and made a painted a pirate hat too. After we were done painting, we let the hats dry for a few hours. Once dried, I punched some holes on each side of the pirate hat and added string to keep the hats in place. Nini loved wearing her hat and kept looking at herself in the mirror. I even got her to say, "Arrrhhh" like a real pirate. Ha ha! This was a fun craft. It would be great to do with any toddler or young child, especially if they're into dress up or painting. This activity is great for child development. It helps with fine motor skills, creativity, imaginative play, and sensory stimulation. So make some pirate hats and go sail the high seas! Do your kids like playing make believe as pirates? Have you done any fun crafts with your little ones lately? Let me know in the comments! Halloween can be a really fun time for toddlers and parents to celebrate. Between holiday crafts, trick-or-treating, and parties, there's plenty to keep little ones occupied. But there's also a darker, scarier side to Halloween that's inappropriate for toddlers. This can be especially true for Halloween movies; many are just too scary or adult themed for young kids. To help you, I have put together a list of toddler-friendly Halloween movies that will put you and your little one in the mood for tricks and treats! "Halloweentown" is a cute movie about a family of witches and a town of friendly monsters and Halloween creatures. This movie is a little on the cheesy side, but it will definitely get you in the Halloween mood. 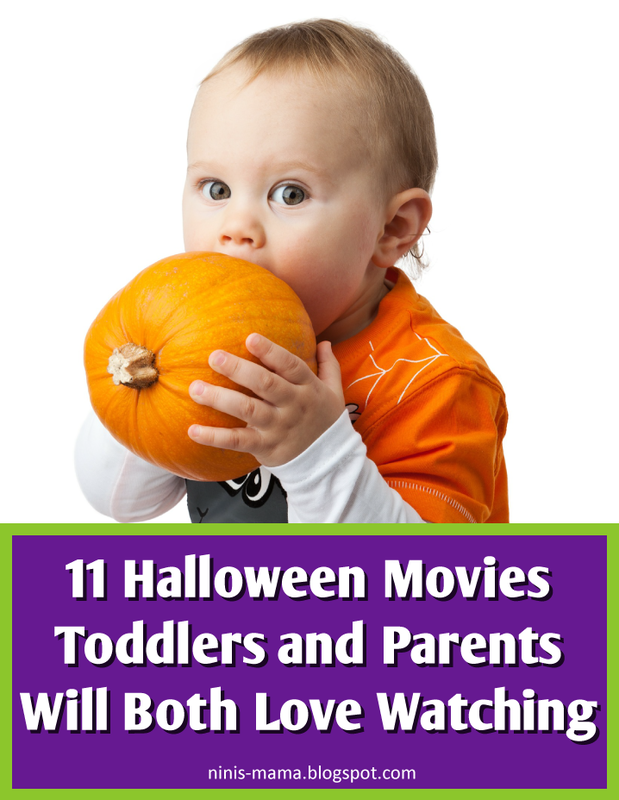 And your toddler will love watching this fun story play out, and the not-so-spooky characters. This movie may also make you feel nostalgic. If you're like me, you grew up watching Halloweentown on Disney Channel. 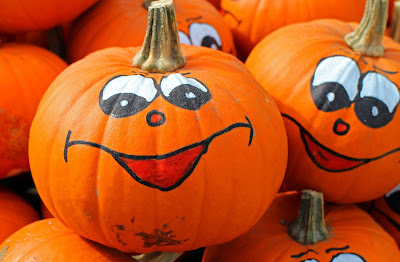 "Curious George: A Halloween Boo Fest" is a fun Halloween adventure for little ones to watch. Parents will enjoy the adorable and festive feel of this movie with a familiar friend, George. "Nightmare Before Christmas" is one of my all time favorite movies. It's the first movie I remember seeing in theaters at a very young age. I love the fact I can now share it with my two-year-old daughter, Nini. She already knows some words to the song, "This is Halloween." "Nightmare Before Christmas" is a little more on the spooky side, but I have never met a young kid who didn't love it. All about Jack Skellington and his search for the meaning of Christmas, it is a classic for sure! "Casper" has a great story line for parents to follow. Toddlers will enjoy watching the cute ghost, Casper. It's Halloween fun all around! "Corpse Bride" has fun songs and animation. Plus it's got a spooky feel parents will enjoy. 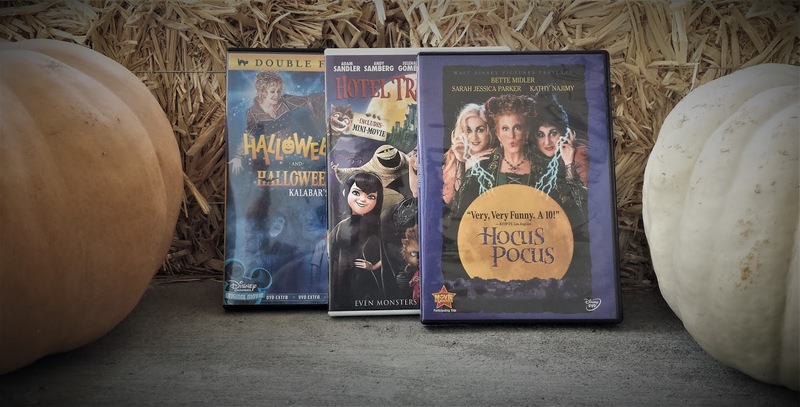 "Hocus Pocus" is another Halloween classic I love! It's about three witches who come back to life on Halloween, and a group of kids who try to stop them. My daughter, Nini, couldn't take her eyes off the screen during this movie. There's plenty of laughs and great acting for parents to appreciate. "Hotel Transylvania" and "Hotel Transylvania 2" are both fun stories about not-so-scary monsters. Kids will enjoy the animation and parents will enjoy the comedy and story lines. "Mickey's House of Villains" is a movie special based on the TV show, "Mickey's House of Mouse." This is a cute movie for toddlers, full of familiar Disney characters. It also includes clips of some classic Halloween cartoons. "Frankenweenie" is a spin on the classic Frankenstein story. It's about a dog who is brought back to life by a boy named Victor. Toddlers will like watching this cute little dog while parents will enjoy this take on an old story. "It's the Great Pumpkin, Charlie Brown" is a classic show toddlers will love. Parents will enjoy this Peanuts holiday special, as well. If you've never seen this one, do yourself and your family a favor, and check it out. Well there's my list of parent and toddler-friendly Halloween movies. What Halloween movies do you enjoy watching with your toddler? Are there any I didn't include in this list? Let me know in the comments! Ear infections and little kids tend to go hand-in-hand. Your child may be in and out of the doctor frequently and on antibiotics. If this sounds like your child, you may be thinking he or she needs ear tubes, or your pediatrician has recommended them. 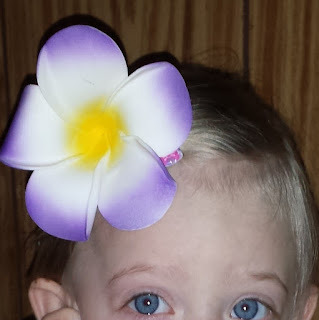 My daughter, Nini, had to get tubes in her ears earlier this year. I'm going to share my experience with you so you can have an idea of what to expect. Nini, has had many ear infections in her first two years. It got so bad, she basically had an ongoing ear infection for three months. She had been on four or five types of antibiotics over those months without success. Nini's pediatrician recommended we see an Ears, Nose, and Throat (ENT) Specialist. The ENT determined Nini would need tubes. The procedure was explained to me as a surgery where a small part of the skin is cut open in the ear, then a tube is inserted. The tubes help drain the infection and decrease chances of future infection. The word "surgery" was scary, but I was reassured the actual procedure would take about five minutes. The longest part is putting the child under anesthesia and waking up. Nini's surgery was very early in the morning. 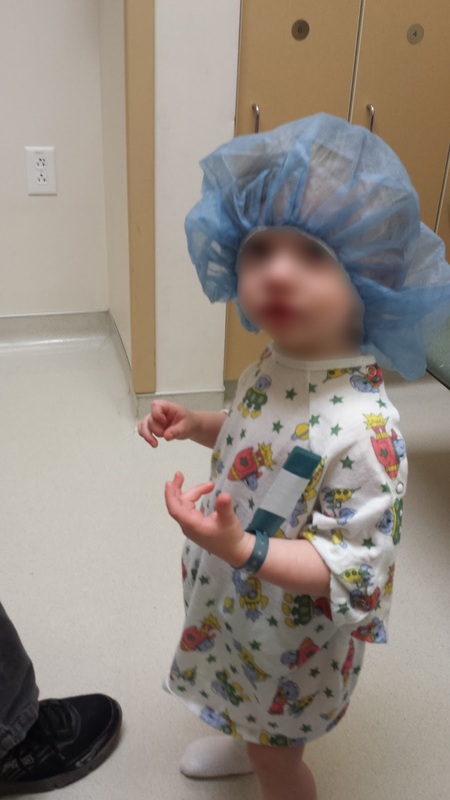 I was told that generally surgeries for children this young are done early for convenience. You are not allowed to give the child food or drink the night before, so doing the surgery early makes it easier on little ones. In fact, that was one of the hardest parts of the whole prep for surgery. Nini really wanted food and was upset about not getting any. I brought Nini to the surgical center about two hours before the procedure. I filled out paperwork and talked to several people about the procedure. Everyone was really nice and calmed any nerves I had. They even let Nini take her favorite stuffed animal to the operating room. Once she was back in the operating room, the procedure seemed to go really fast. When Nini was brought back to me, she was groggy and fussy, but doing well overall. I was instructed to give Nini pain meds, like Tylenol and Ibuprofen over the next few days, and put prescribed medical ear drops in her ears. I was also told some bleeding in the ears after surgery was normal. Getting tubes is an outpatient procedure, so within a a half hour after Nini was out of surgery, we returned home. For the rest of the day, Nini was lethargic and a little fussy, but she seemed to be feeling more normal by the end of the day. What surprised me most was how fast she bounced back post-op. Since the tubes were inserted, I have noticed a big difference in Nini's ears. 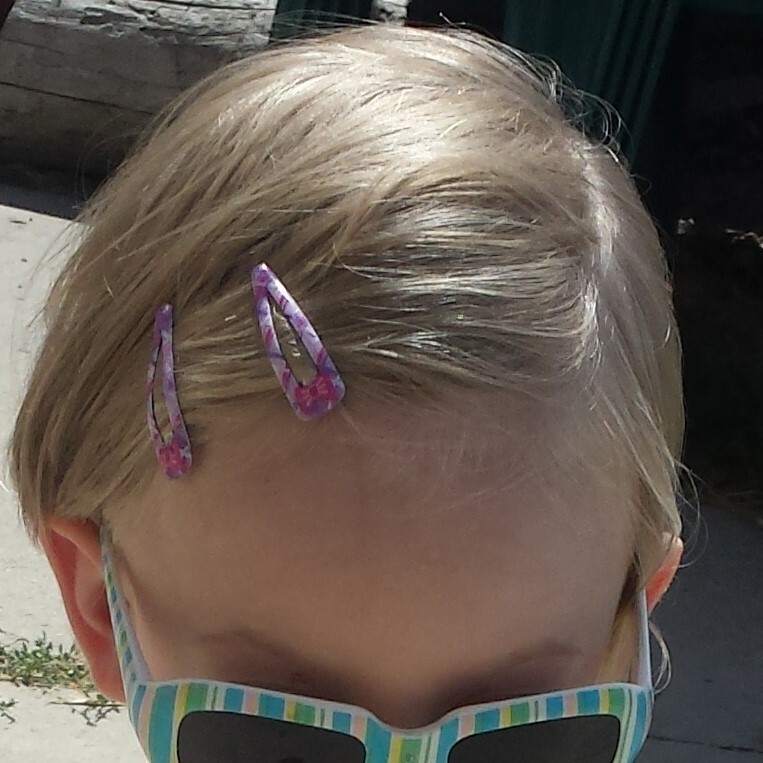 Her ear infections have been far less frequent, and we have not had nearly as many trips to the doctor. When she does have ear infections, it is a lot easier to tell because green or yellow fluid with a fowl odor leaks from her ears. It usually clears up on its own. Nini got tubes about six months ago, and she's only needed medical intervention one time. Instead of antibiotics, she had to have the ear drops again. The ear tubes are supposed to fall out on their own six months to three years after they are inserted. Ear tubes made me nervous, but they've made a world of difference for Nini. She gets sick less frequently and is generally happier. If your child has many ear infections and you think he or she needs tubes, rest assured it is a relatively simple procedure. It may seem extreme, but many kids need it, and it helps a lot. My experience is not exactly the same as others, but hopefully it helps as a a general guideline. 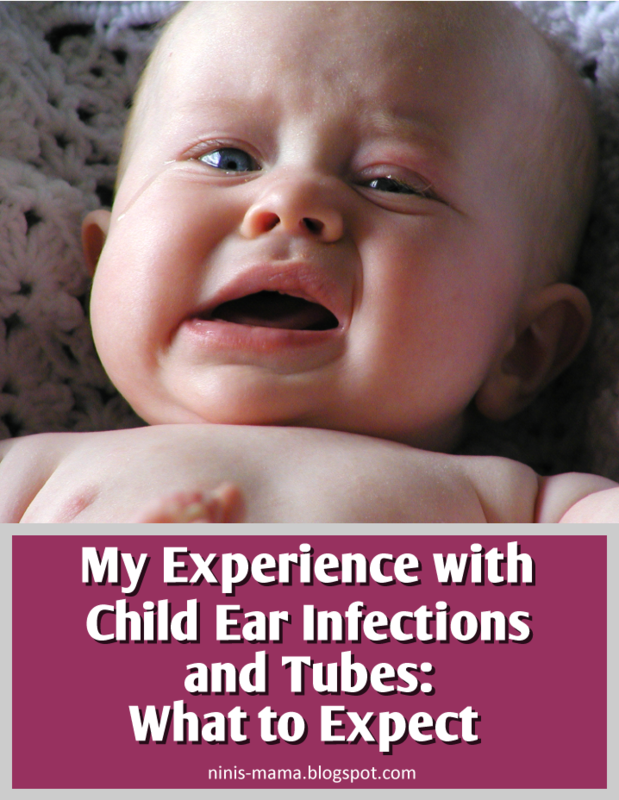 Do you have experience with ear infections or tubes in your kids' ears? Let me know about it in the comments. This post contains a few affiliate links. Anyone who knows me well, knows that I LOVE Halloween! I go all out with decorating, activities, and costumes. Every year so far, my family has done themed family costumes. For the most part, they are homemade and pretty easy to put together. 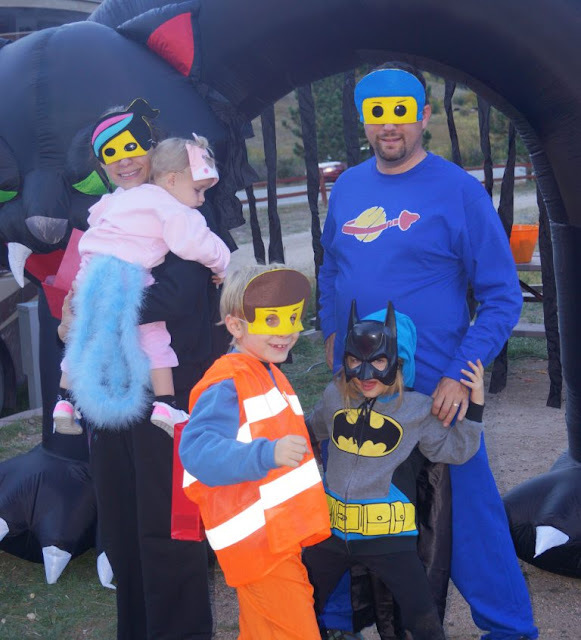 To share my love of family Halloween costumes, I have teamed up with fellow blogger, Krystal Miller from Healthy Happy Thrifty Family. 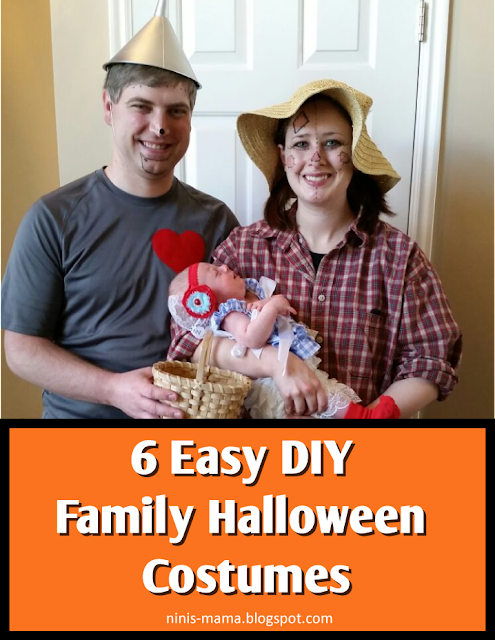 We will be sharing some easy DIY costumes you can use as inspiration for your own family! These costumes was pretty easy to put together. 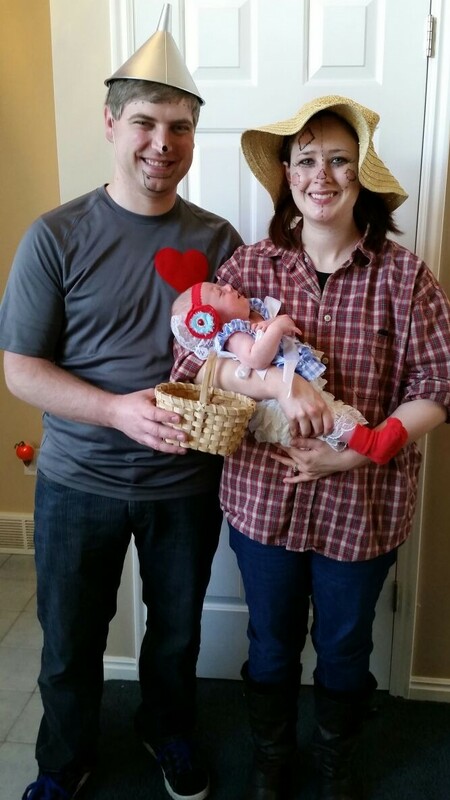 We bought the baby Dorothy costume from an online boutique. For the Tin Man costume, we already had a grey shirt on hand. We simply sewed a felt heart onto the shirt. For the hat, we spray painted the funnel grey and added string to keep it on. For the scarecrow, I wore my husband’s flannel shirt, added a floppy hat I found at a thrift store, and topped it off with scarecrow inspired makeup. For the witches, we already had black dresses on hand. To create a more witchy effect for my costume, I started with a plain black dress, then added layers of black clothes I already had. I found my witch hat on Amazon. I cut off the excess fabric and decorated it with some clips and tulle. The child witch hat I found on Etsy and the cauldron came from Amazon. We found the brooms at different stores while out shopping. My husband, Ryan’s warlock cloak was borrowed. 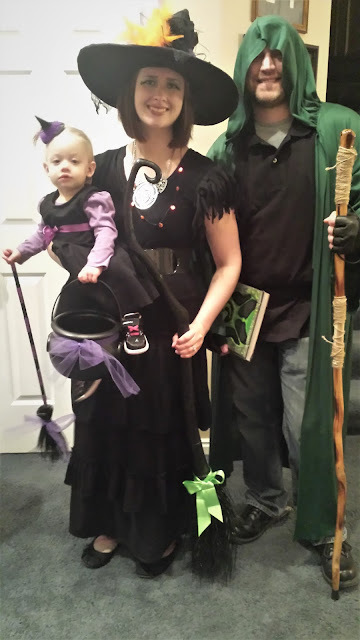 He made the spell book from an old sketch book and the walking stick came from Amazon. 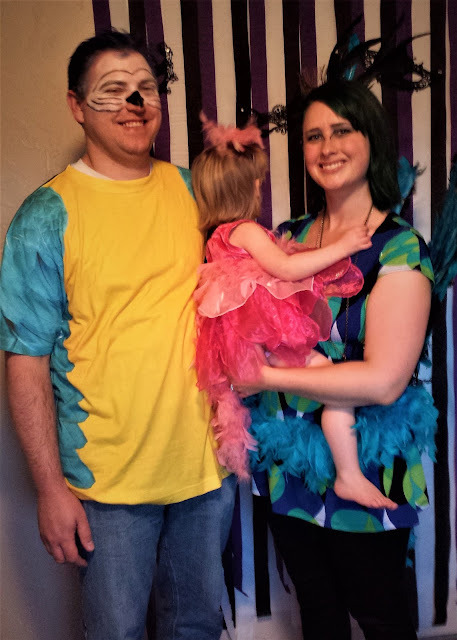 For the parrot costume, we found a shirt with a parrot design from Amazon that worked great. We bought black and white costume makeup and blue hair spray from a Halloween store. For the flamingo costume, I found the pink dress at a clearance sale from a boutique. 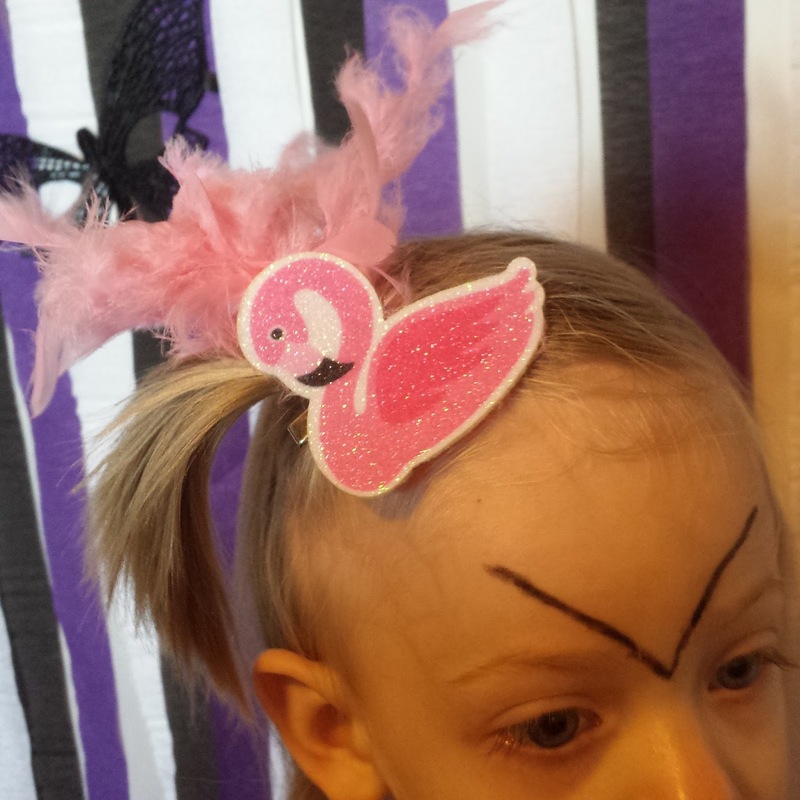 The pink boa came from a dollar store and was sewed on. 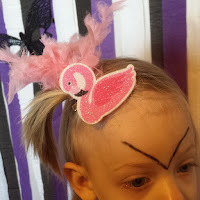 I made the hair clip using a flamingo headband and extra boa feathers I attached to a barrette using a glue gun. For the peacock costume, I used a blue and green shirt I already had. I added a boa around my waist and a peacock clip in my hair that were both borrowed. I got the wings from a Halloween store. My hair happens to be dyed green right now, but it worked well for this costume. To get this color, I mixed the Manic Panic colors, Enchanted Forest and Dark Envy. These LEGO movie costumes were a combination of DIY and store bought items. We used iron on transfers to put the logo on Unikitty and Benny. Wyldstyle was created using black sweats and fabric paint. We purchased the orange vest online and already had the batman sweatshirt. The masks are handmade, but were purchased on Etsy. For more details on these Lego Movie costumes, click here. 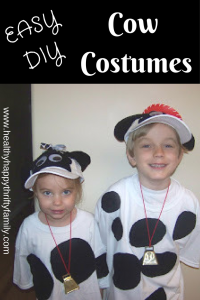 These cow costumes were really easy to make. We added black spots to white shirts with the iron. We also decorated plain white hats with cow print and eyes and made cowbell necklaces and tails. For more details on these cow costumes, click here. Our costumes for this year are Angry Birds. They're made out of felt pieces, sewn together and stuffed. We added feathers and decorated our trick or treat buckets to match the theme. 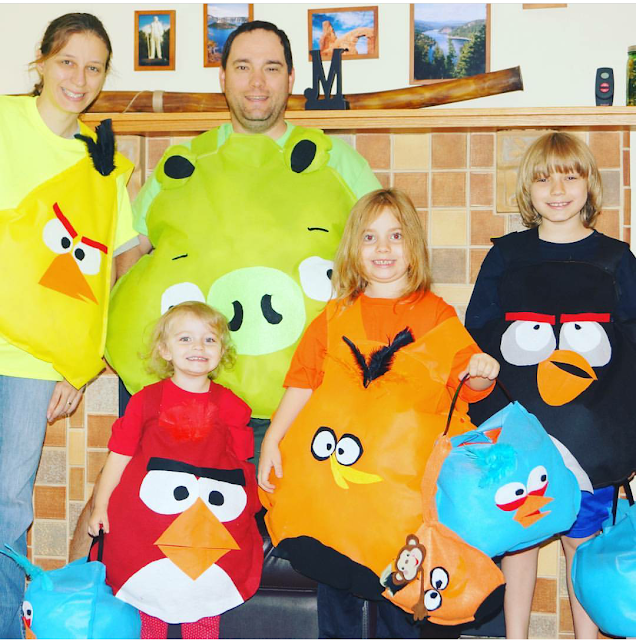 Check out Krystal's Angry Birds costumes on Instagram by clicking here. Well I hope this gives you some ideas on DIY family Halloween costumes! Are you and your family wearing group costumes this Halloween? What will you be going as? Let me know in the comments! If you are like me, styling hair is not your forte. I can barely use a curling iron! 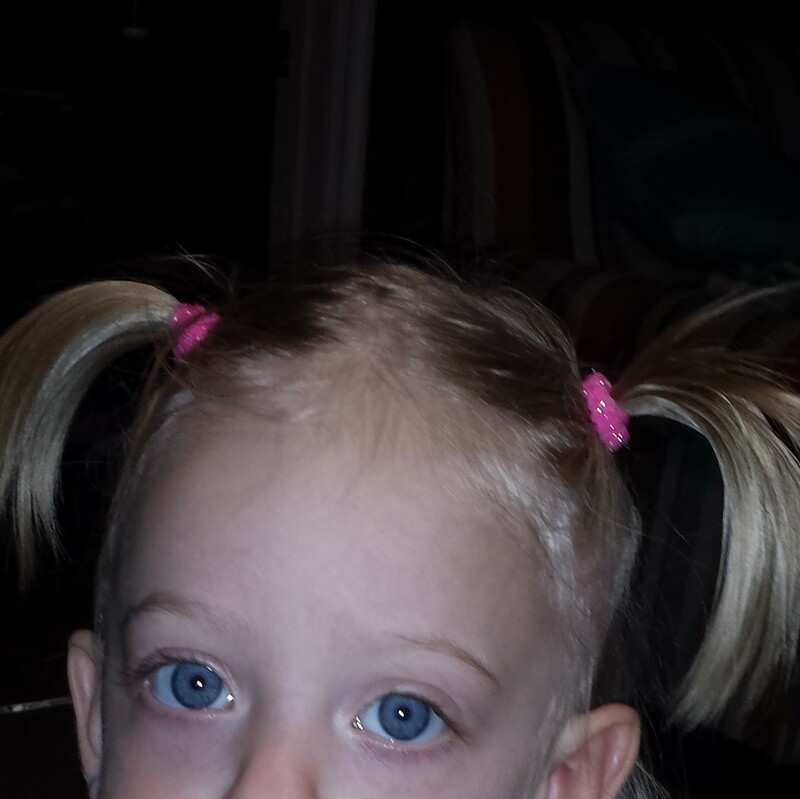 Doing your little girl’s hair can be intimidating. 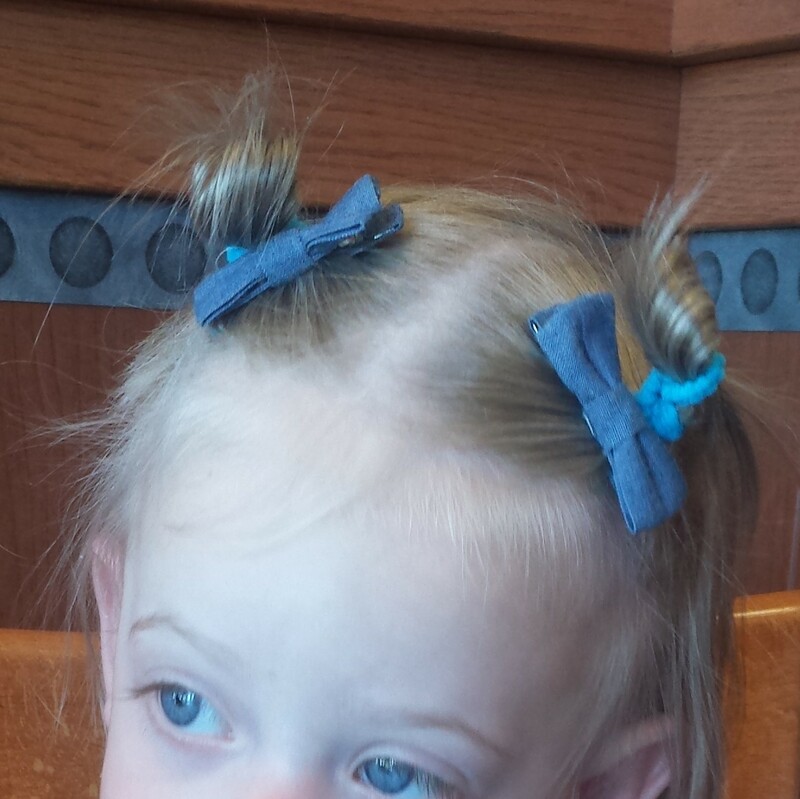 I have seen many elaborate hairstyles on little girls that are adorable, but I have no idea how to recreate them. 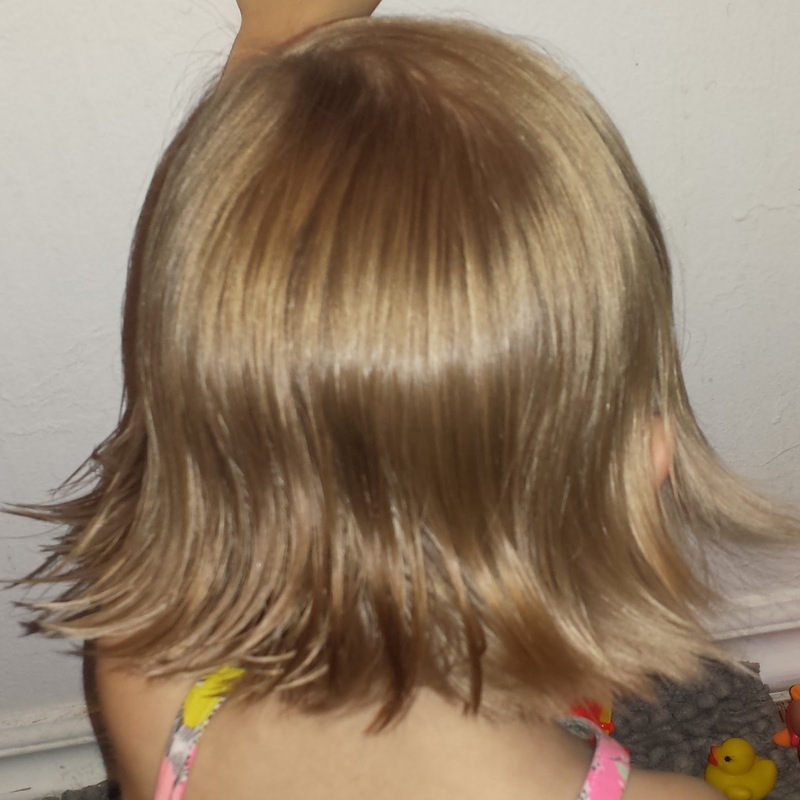 My little Nini, like many other toddlers, is not willing to sit long for an intricate hairdo. And that’s assuming I could even create the hairstyle. 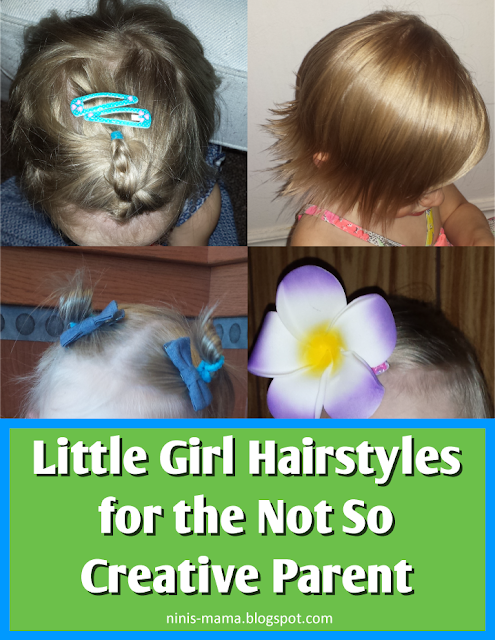 Over the last year, I have found some hairdos that are pretty simple to do. They are quick, easy, and still really cute! I’m going to share some hairstyles I do on my toddler. This is my go-to hairstyle. It’s super fast and simple to do. Use a comb to gather the front part of the hair. Then pull it to the side and put a hair tie in to secure. To help me gather the hair, I sometimes use some baby lotion or mousse to smooth out the hair. I often add a clip or bow to step up the cuteness factor on this hairdo. Start out with wet hair. I usually do this hairstyle on Nini right after her bath. Put a little bit of mousse at the ends of the wet hair. With a round brush and a blow dryer on low heat setting, turn the ends of the hair out. Point the blow dryer upward under the hair to make the hair turn out. Add a little more mousse and some hairspray if you would like. Back comb (rat) the front of the hair with a comb. Then smooth it back and secure with a hair tie. 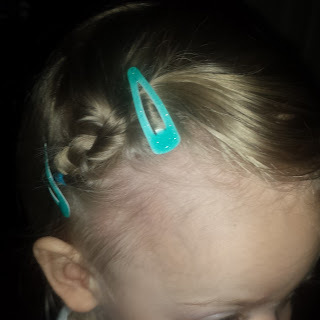 If your child has fly away hair, add some clips to secure. 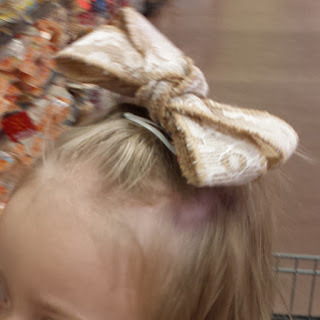 This is another hairstyle that’s fun to add a bow or hair clip. Some days there just isn’t time to style hair. For these days, I simply comb the bangs back and pin them with clips. It’s still cute and gets hair out of a toddler’s face. To make the pinned back hairstyle look more elaborate, simply follow the same instructions and add a bow or flower clip. 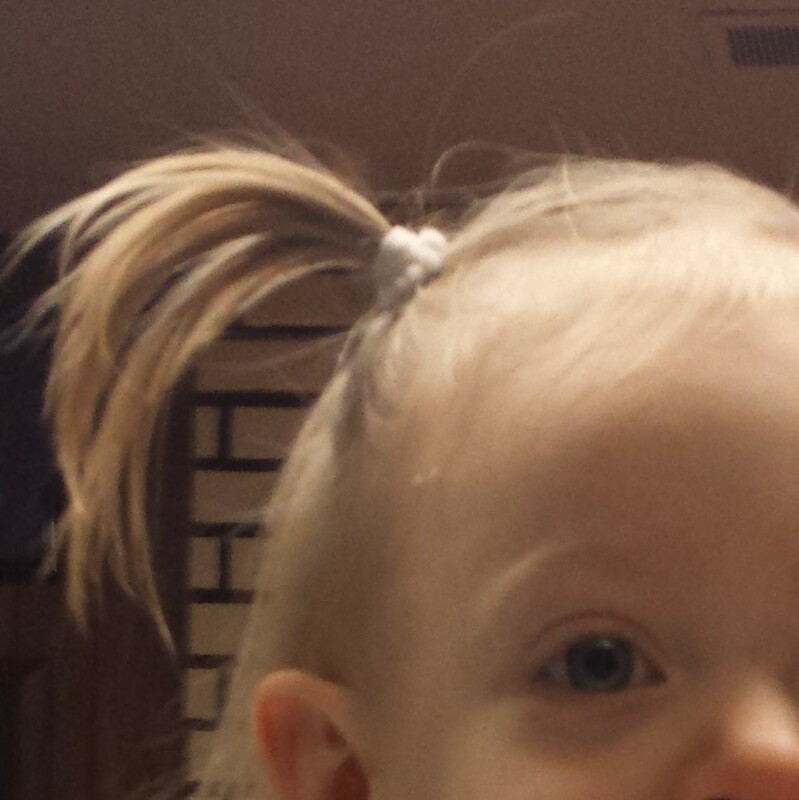 Nini’s hair is not long enough to put all her hair in piggy tails, so we stick with half-up piggy tails. For this style, use a comb to split the top half of the hair from the bottom. Then split the hair into two sections. Do your best to make them even and the part as straight as possible. Secure each piggy tail with a hair tie. The instructions for this hairstyle are the same as the piggy tails until the point where the hair is secured in a hair tie. Just don’t pull the hair all the way through the hair tie, and it will create this completely different look! This hairstyle is a little more difficult, but still pretty easy to do. Separate the front part of the hair from the rest. I sometimes add a thin plastic hair tie at the start of the braid to secure the hair, but it’s not necessary. Braid the hair towards the side, and add a plastic hair tie at the bottom. 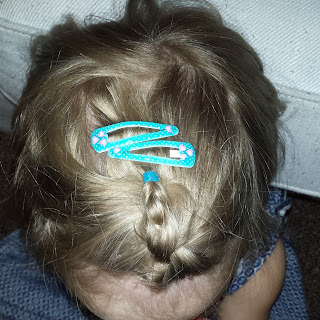 Use some clips to pin the hair down. A little hairspray helps make this style last. This might be the most difficult hairstyle of these simple dos, but it’s worth the effort. Nini’s hair stays in all day with this hairdo, even through all her running and playing. For this style, part the top part of the hair from the rest. Pull the hair straight up and braid it, then secure the end with a plastic hair tie. 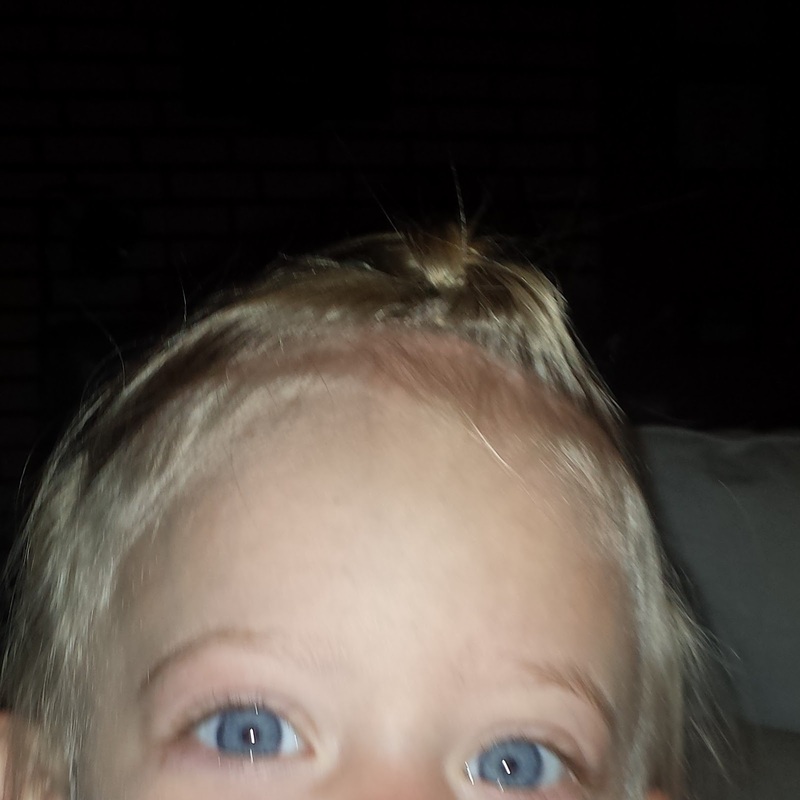 Pull the braid back and clip to the head. This hairstyle is easier to do if the hair is a little dirty. 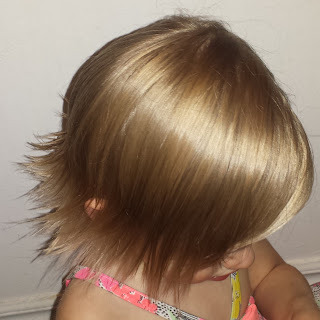 So, if you don’t wash your child’s hair every day, try it out on a day the hair hasn’t been washed. If you want to do it on clean hair, add a little mousse to the hair. Well I hope this gives you some good ideas for easy little girl hairstyles. Happy styling! So what tips and tricks do you have for styling your little girl’s hair? Let me know in the comments! Hi and welcome to my blog! My name is Cara. 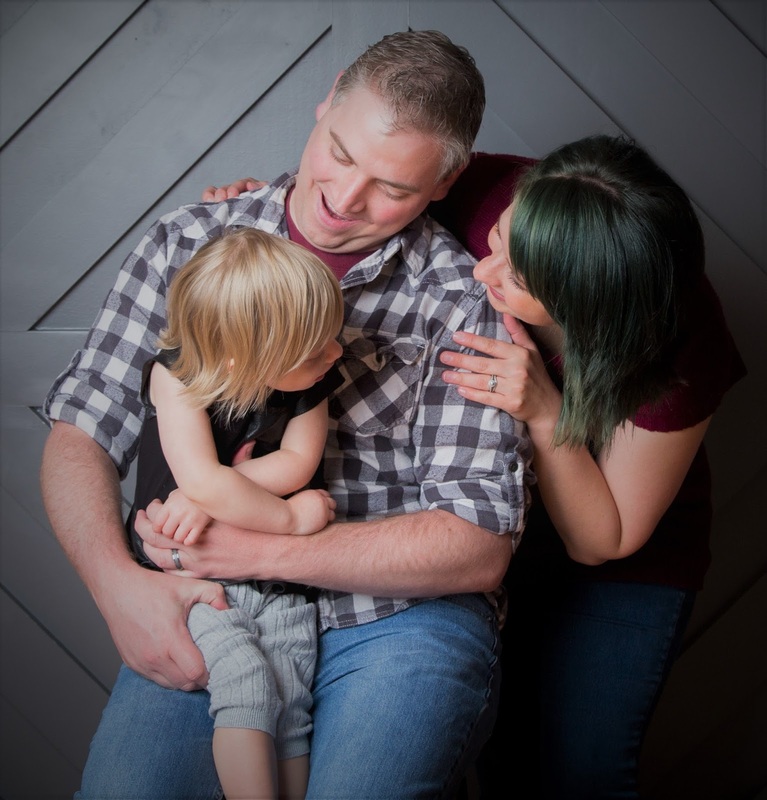 I have started a blog to share my thoughts on parenting and family life. The blog name, "Nini's Mama," comes from my daughter's nickname, Nini. I have been around kids constantly since 2010, with the birth of my nephew. I have been working with kids professionally since 2011 when I became a nanny. I had the opportunity to be a nanny for a few different families, giving me the chance to see a variety of parenting and family dynamics. In 2014, I started working for a nonprofit organization helping trauma based kids in a therapeutic environment. I worked there until 2016. I continue to be involved with this nonprofit on a voluntary basis. I have also done internships working with kids and parents in early intervention and a family education program. If I had to guess, I have worked with a few hundred kids, mostly infants and toddlers. I have a Bachelor's degree in Behavioral Science with a Family Studies emphasis. 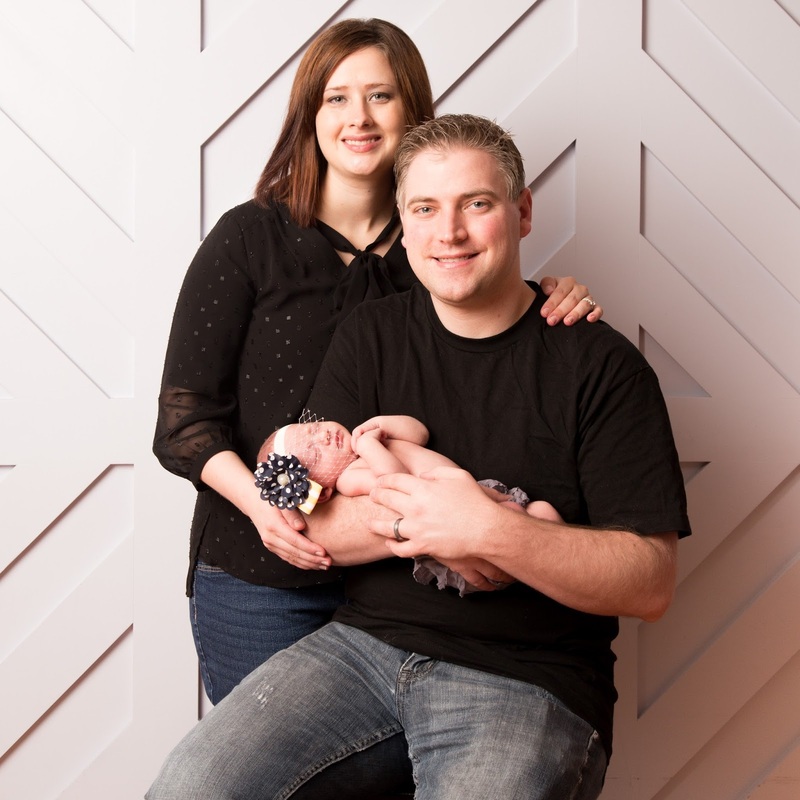 I got married in 2013 and became a mom in 2015. These days I'm a stay at home mama to a wonderful daughter, my little "Nini." Some other things about me, I’m a big nerd! My fandoms include Star Trek, Supernatural, and the MCU (Marvel Cinematic Universe). In my spare time, I help my husband with his online t-shirt company, Ink Formation. I also enjoy drawing. I post some of my work on Instagram. This blog is about my own experiences and opinions. Nothing should be taken as fact, unless otherwise stated in a blog post. My goal is to empower parents and caregivers to make smart choices for their kids. Thanks for checking out "Nini's Mama!"